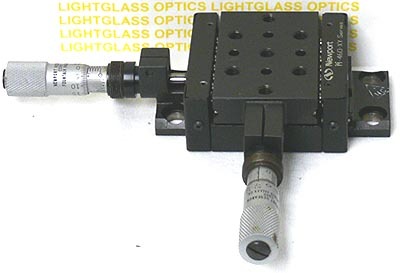 The Newport 460-XY High-Performance Linear Translation Stage is now the 460A, but is nearly identical with the exception of micrometer mounts. This 2-Axis stage utilizes Hardened ball-bearings and precision-ground tool steel rods as guides, so these stages are very accurate. And, since the X and Y axes are machined relative to one another, there is no provision to move them out of alignment. The Newport micrometer actuators are included. This is an excellent value and represents Newports best combination of precision and affordability.